Kind Canada Généreux knows that your information is private and you are concerned how it is used and shared. We appreciate your trust that we will do so carefully and sensibly. By visiting Kind Canada Généreux, you are accepting the practices described in this Privacy Notice. The information we gather helps us personalize and continually improve your experience when using our services. Personal information gathered by Kind Canada Généreux is kept in confidence. Kind Canada Généreux does not disclose, share, sell, or trade your personal information that you may give us such as your name, address, phone number, or email address, to or with any outside companies or organizations. Kind Canada Généreux staff members are authorized to access personal information based only on their need to deal with the information for the reason(s) for which it was obtained. 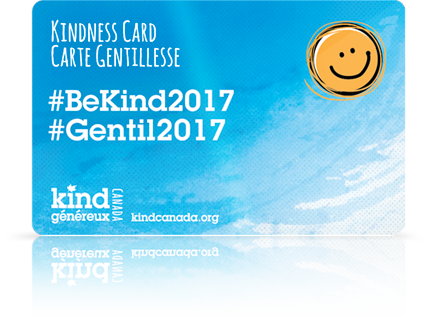 Personal information will only be collected and used by authorized staff consistent with the activities of Kind Canada Généreux. We take measures to ensure the integrity of this information is maintained, and to prevent its being lost. 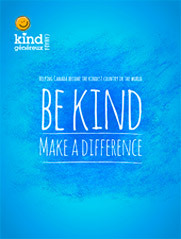 If you register through the E-mail updates, Kindness Pledge or Kindness Cards and/or become a sponsor, associate, stakeholder, donor, member, customer or, establish a business relationship with Kind Canada Généreux we may, with your permission contact, you by email or keep you up to date with our newsletter. You may unsubscribe from our email lists at any time. Cookie data is not used in any way that would disclose personally identifiable information to outside parties, unless Kind Canada Généreux is legally required to do so in connection with law enforcement investigations or other legal proceedings. Kind Canada Généreux maintains log files of all access to its site and also monitors network traffic for the purposes of site management. This information is used to help diagnose problems with the server and to carry out other administrative tasks. Log analysis tools are also used to create summary statistics to determine which information is of most interest to users, to identify system problem areas, or to help determine technical requirements. Protocol: the technical protocol and version used: i.e., http 1.0, ftp, etc. The above information is not used in any way that would reveal personally identifying information to outside parties unless Kind Canada Généreux is legally required to do so in connection with law enforcement investigations or other legal proceedings. Our site may contain links to other sites. Kind Canada Généreux is not responsible for the privacy practices or the content of such websites. This website is copyright of Kind Canada Généreux and may not be copied, either in part or in whole. As we respect your privacy, we kindly ask in return that you respect our copyright.